Do you know about the awesome podcast, What Should I Read Next? It is the show for every reader who has ever finished a book and faced the problem of not knowing what to read next. Each week, Anne Bogel, of the blog Modern Mrs. Darcy, interviews a reader about the books they love, the books they hate, and the books they’re reading now. Then, she makes recommendations based on that person’s tastes and her seemingly infinite mental card catalogue of every book every published. What are three books you love? What is one book you hate / didn’t like? Having each person’s picks in advance allowed us to thoughtfully consider books that person would enjoy, and come to the main event armed with suggestions. When we gathered together for dinner, we took turns going around the table telling why we loved the books we loved, and what rubbed us wrong about the books we didn’t like. We pulled out themes based on preferences (i.e. WWII historical fiction, endearing narrator in a story well told, dystopian epic, family saga, mildly disturbing memoir, etc.) and discussed favorite authors. Then we played literary matchmaker for each other by answering the big question for each person: “What should I read next?” It was so nice to hear sentences like “If you loved The Nightingale then you HAVE to read All the Light We Cannot See.” “If you appreciated The Sound of Gravel then download Under the Banner of Heaven on your Kindle immediately.” Around the table a cumulative zillions of pages had been read. It was like a live version of Pandora–but for books–with wine and dessert. For your reading pleasure, I wanted to share the books that each of us identified on our three BOOKS WE LOVE lists. I am not going the mention the books we hated because we all know the internet is a place for only kind words, rave reviews, and positivity. I implicitly trust the taste of these ladies, AS SHOULD YOU. 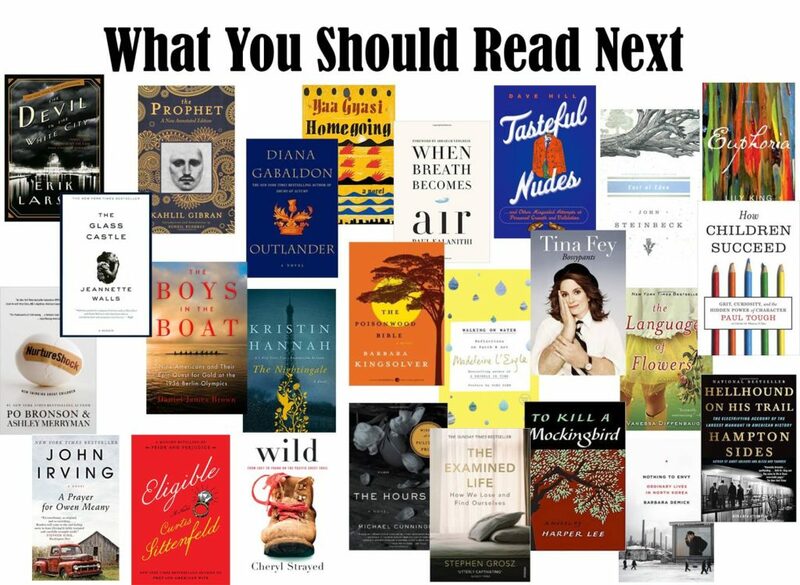 So look no further than the list below to decide what you should read next. I know these titles will grace my bedside stack for months to come. Definitely consider throwing such a dinner with your book club or a group of your bookish friends. It is a surefire way to reinvigorate your reading life, a new way to connect with old friends and get to know new friends better. Great conversation guaranteed. Such a fun idea. I was actually thinking of doing something like this! Love to hear how it worked out!